We are happy to introduce a man we consider to be an important teacher. 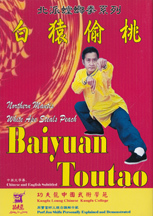 Shifu Porf (Pou Fu/BaoFu) Jou (Chou) began learning Chinese Kung Fu from the age of 6 under Sifu Wang Son-Tyng, a master from the Wing Dao Central Chinese Martial Arts Institute. At the age of 16, Shifu Jou, following the last words of his instructor, started to teach the public. 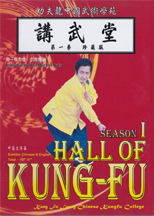 From the age of 18, Shifu Jou had the opportunity to interact with numerous masters from many styles, allowing him to research the theories and applications behind different branches of Kung Fu. Always a supporter of Chinese Martial Arts, Shifu Jou has seen a pattern of change which prompted him to found the Kung Fu Loung Mass Communication in 1993. This dedication aims to keep alive the traditional legacy of Kung Fu. Shifu Jou is not your usual martial teacher. He is a powerful and dynamic performer, an inquiring instructor and an enthusiastic practitioner. Now in his sixties, his performance remains strong and heroic. Some intro clips are used repeatedly between DVDs. Good subtitles, with an occasional misspelling. All strikes and slaps “sound enhanced” and a bit loud, but useful to catch timing. Some sets may seem a little pricey, but note the time lengths of each series. Hidden Flower comes from the Liu He branch of Tang Lang (Northern Mantis). One of its specialties is a very close fighting range. This is definitely highlighted by Sifu Jou’s vertical drop punches, arching back, and quick seemingly off-balance evasions. In other words, everything beginners are told NOT to do. But skill makes anything possible. In addition, Jou Sifu is a unique teacher with a distinctive signature to his art. To our eyes, he follows the classic training patterns of excellent basics that must, at some point, break out into near drunken style to validate the practitioner's higher level skills. Jou has done this to the point of his own unique, dramatic, but definitely advanced performance. You have to know all this to understand what this version of a form may become. For instance, this long form is filled with variations of technique, angle and style. Some flashing kicks, fast and intricate hands, everything has the feel of both homemade and authentic. Boy, did we sell out quickly on this one! We're digging around for more, but until then, add your name to the want list and we'll let you know when these come back. 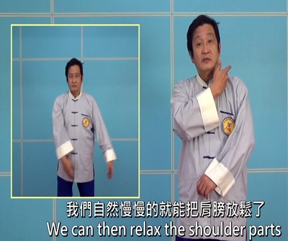 Here Sifu Jou takes a head on, straight run at the subject of Qi Gong. Rather than discuss its legends and stories, he wants to bring you immediately into the Qi Gong courtyard to begin practicing. His initial emphasis is on relaxation (Song), but with structure and intent. Some of this information you may hear for the first time, even if you are an experienced practitioner. This is the case, in part, because this Qi Gong comes through the martial heritage and, because of this, shows many movements that fit well within the range of martial studies. His attitude to this practice is open-minde, and he encourages individual customization for all exercises. 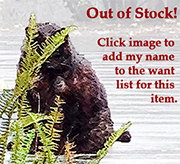 OUT OF STOCK ...but we expect more! Please place me on your WANT LIST for this item. And look for our new upgraded site, making want tags like this a thing of the past. This is a top notch presentation of basic counters and techniques, with a distinct Mantis flavor. The responses are based on a quadrant system. And when they come, they come like a rainstorm. Porj Jou puts a strong emphasis on both finding leaks and continuous hand striking. As one might suspect, there is a decided focus on speed here, with fast hand combinations sometimes barely visible. Many ideas in this 3 1/2 collection, and a systematic approach that interweaves defense, attack and even Mantis control movements that take the opponent to the ground. Chen is considered the “mother” of Tai Chi. Over the last half-century the presentation of Chen Tai Chi on the mainland has become more consistent and, in some cases, less functional. The Chen Tai Chi that was scattered by war and circumstance has kept alive certain flavors that help us see Chen from a different angle. Fist, and most obvious, is a no-nonsense martial carriage. You would need to go out of your way to really believe that this is NOT a martial arts. Secondly the vast amount of Chan Si Jin (reeling silk) evident in any Chen performance is here kept strictly as a boost to the functional. Some versions of Chen have started to suffer from what one might call “flourish.” The body mechanics shown in this version’s applications is powerful and sophisticated often wedding Chin Na with some form of striking. 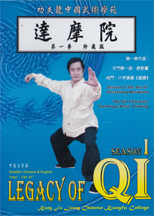 Sifu Jou’s instructions show his originality and decades of experience. In the special Praying Mantis style curriculum, this form was used to test the student’s ability to link, rearrange and generally adapt the mantis movements. 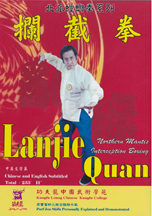 Eventually, a standardized form emerged that was so good it was preserved, renamed and is taught today as LanJie instead of Luan Jie. The form contains many hook hands, elbow strikes, short kicks, circle blocks and direction changes. Though about medium length, some of the movements will seem simple and direct, but all maintain the flavor of the mantis. There are fewer jump kicks here and less of a “Shaolin” flavor making this a fine routine for those less interested in aerial techniques and more in acquiring authentic mantis flavor. A very good set to gain insight into Mantis’ combinations and changes. Exceptional instruction. When you perform real Mi Zong your body motions might very well exhibit movements that look like classical, recognizable Kung Fu. At the same time you might be doing, from the inside, patterns, thoughts and internal controls that are completely strange and unfamiliar. In China Mi Zong (Lost track or aka Yen Qing) is a big style that also has a number of marriages with other styles such as Lou Han. It has many forms, a carload of weapons, a hefty collection of self-defense movements including Chin Na. The story has it that a member of the Liang Shan (Water Margin) fighters took up residence in Shaolin and further developed what was then an unbeatable style. Skip ahead a thousand or so years and the top boxer at the Jing Wu Association was Yuan Hun Jia, a tremendously strong martial artist who was probably poisoned by Japanese agents. What do you see when looking at a MiZong form? First the angles are slightly off, some leaning forward, some slight over stretching, some unexpected hand positions. Second the footwork is chancy with steps unlike what you would expect next. Crossovers, cats and sweep stances are intermixed like a bag of jelly beans. The same is true of stomping actions to augment power. At no time do they become frozen in a pattern. Another difference from most Chinese forms is that the movements have few repeats or refrains. Movements are dropped as though a pack of cards in just about any order. 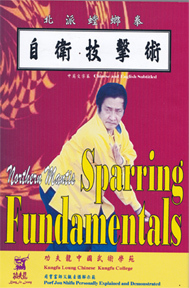 MiZong emphasizes “structure” training, as just about any martial art does. But, due to the flexibility of sequence and direction, the Qigong and postural aspects of the training become very important. This is a key form in the Northern Mantis system. Not for beginners, it is more a “graduate level” routine. LiPi is another of those traditonal forms which should be understood, analyzed and even broken apart to reveal its secrets. The knowledge of the meaning of the form is evident in Shifu Jou's focused, powerful and changeable performance. This is a medium length performance with a lot of hand exchanges and unusual leg combinations. Everything that teacher Jou demonstrates has that particular angle and inflection revealing the difference between a generic—here’s where that move is supposed to be—and someone who is actually applying these movements in his mind as he practices. This form demonstrates lightning speed coupled with many attacking combinations. As before, the instructions are in-depth, with clear camera work from a number of angles. This is a good form to give the impression of the living mantis vs. the posing mantis. As always with Shifu Jou's DVDs, interesting, different and even thought-provoking applications and fighting principles are discussed and demonstrated. This is one reason mantis is known as a “combat boxing” style. Note: The form in the series also suffers a bit from the enhanced sound effects of the blows. We have decided, though, that the slaps and sounds are more Instructor Jou’s way of showing the timing and the beats than any attempt to create a “Hollywood” effect. 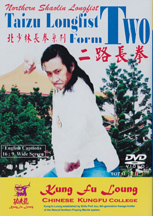 In this valuable DVD, Shifu Jou deconstructs Kung Fu. He lectures about key issues in the study of Chinese martial arts. Nothing is too “simple” for him to analyze. 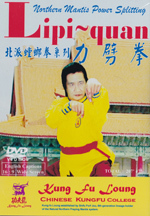 In each section he shows the flaws and misunderstanding so easy to acquire when studying Chinese martial arts. Every section clears up some points and introduces new puzzles. It is always a pleasure to hear someone who actually knows his subject and has given thought to it. And, as often happens in these cases, not only does the information surprise because it is “new,” but it will occasionally restructure the entire subject in your mind. Shifu Jou concentrates his microscope on those questions people ask which are questionable themselves: What are the martial arts for? Different basics for different levels? What are the real dynamics of fighting. Practical, informative and definitely thought-provoking here are the observations you always wondered about, like that teacher you had questions for but never a chance to ask. This is the Long Fist form rooted in Shaolin style. TaiZu is sometimes called the “Mother of Long Fist.” Surprisingly, it also has claims as the predecessor of Tai Chi. The first form sets the pace with jumps, dodging, evasive and attacking footwork. This is quite a form on its own, but Shifu Jou’s high level interpretation makes it something special. Don’t expect the ever-upright mechanical style so many people demonstrate. This is a chance-taking, off-balance, extremely dynamic rendition that finally makes the designation of advanced Kung Fu come alive. 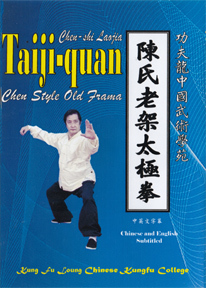 A medium-to-long form, it contains many Long Fist full extension strikes, wide angle moves like striking at the ground from a crane stance, and a lot of implied Chin Na techniques. He not only gives applications but discusses an entire cognitive approach to them which is, to our ears, exactly right and definitely mature. TaiZu is a favored and sought-after form and the fact he has two levels of it is quite unusual. This goes to an even higher level of martial skill. Many unusual hand locks and some challenging kicks. But if Sifu Jou can do all this at fifty, you certainly can too. The first form is known as Chang, or "Long" and the second is known as Xing or "Walk". Between just these two Taizu forms, you have the basis of the entire system. There are still a lot of versions available that are “traditional,” though those demonstrations are mediocre and somewhat mechanical. You definitely will not have this problem. Shifu Jou is fierce and he sticks to the idea that “traditional” can also means “with heart.” A complex, explosive and fascinating form with predatory energy. 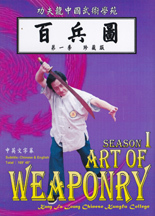 Many weapons are surveyed in this presentation/lecture on the Chinese Kung Fu arsenal. Shifu Jou discusses the reasons, the techniques and the specific characteristics of such weapons as the Kung Fu spear, sword, saber, and many more. His goal is to introduce the listener to the very essence of each weapon and show how its training can enhance your understanding of the spirit of Kung Fu. He also shows a thorough knowledge of the Iron Rulers (Sai), Rope Dart, Crutch (tonfa), Tiger Hooks and more. There is a long section on the straight sword followed by an instructional piece on tips for taking care of weapons including rope dart construction. Finally, a few pointers concerning the best way to study weapons. With hands very fast, there is a wealth of Chin Na implied in the movements. The instruction is nicely broken down with clear English subtitles. Jou filmed this around his 50th birthday, which is almost hard to believe considering his skill, kicks, range of motion, and power. Applications, intelligent ones, are shown with some lively and thought-provoking commentary. He shows some excellent tips on how to interpret and coordinate a classical form. For instance, Teacher Jou continues to remind us to break away from the ORDER of movements in a form and their direction and usage. A spiffy little set with a short form and much White Ape training. The character of the Ape will have a lot of variations (as will the coming Year of the Ape.) In this case, Teacher Jou is celebrating his 60th birthday with vim, vigor and verve. Here is the entire form, breakdown with English subtitles, important sections shot from different angles with extra commentary; overall, a very strong presentation from the teaching standpoint. A short fast form with the addition of Jou’s insights on force, fighting and strategy. Impressions on Shifu Jou’s martial performance. The performances of Shifu Jou show a rare spirit and understanding of Chinese martial arts. Immediately you see that his power and determination is more appropriate to a large auditorium than a school performance. His style of movement is what George Xu might call “predatory.” His power is not just strong but it is fluid, as in the phrase “Gong Li,” flowing strength. More than that, he has perfectly incorporated the classical knowledge, almost lost in modern days, of the calligrapher’s hand going beyond mere accuracy when painting characters, with a panache that at first glance looks off-center and over-committed, but is just the opposite. In a world of nominally correct, but uninspired, practitioners, Shifu Jou is a light. He may not move as “safely” as others but you will not forget him, even if only witnessing his performance. In addition, he is highly knowledgeable and freely talks about all sorts of principles and problems along with the perception of what Kung Fu should be and can be. Not only does he produce form-based DVDs, but also some needed general surveys on topics such as weaponry, giving basic concepts, theory and experience with a wide selection of styles and applications. Many people talk about keeping the Kung Fu tradition alive. Shifu Jou is a physical embodiment of that tradition. Oh my, did I ever like the Shifu Jou material. I would purchase anything the man puts out. Phew! Makes CMA in the States look wanting. Thank you for making these things available in particular. I wish the products were more reasonably priced, but it’s worth it, anyway. Before his items get bought out, I’d like to get an order in for all else he has produced so far. I finally got some time to sit down with Shifu Porf Jou, and these are some of my initial reflections. In terms of technical instruction, Shifu Jou does a good job of walking the viewer through the steps, with the movements demonstrated multiple times with instruction focusing on different points each repetition. The production shows its age a bit in the slow motion sections, as it looks like watching a VHS in manual slow motion, and the “kung fu movie” sound effects, at least for someone like me, sometimes made it hard to pay close attention to the movements. Shifu Jou’s applications are very clever, sometimes too clever, as I see him demonstrate movements that I would never show a beginner, but he makes them look elementary. This is by no means a problem, as there are applications suitable for all skill levels. On a different level, I find Shifu Jou to have a sagacious quality, as he often shares training advice in the form of aphorisms, and his teaching is solid and wise. He doesn’t fall into the trap of unnecessary poetics, either. His “bigger picture” teachings aren’t obtuse sayings that one has to decode, they are practical and clear principles which can often be applied to other styles of martial arts. Though expensive, the amount of content alone would be worth the price of admission. Fortunately, Shifu Jou’s content is of high quality, and so it goes that much further. As someone who has never formally studied a northern long fist, there were things he said which went right over my head. This excites me, as it means as I practice and re-watch the DVDs down the line, I already know there’s more to be learned. The presentation is a must-watch for lovers of traditional Chinese martial arts. Thanks again for what you guys do, and happy new year!